The most recent Chinese import scandal is settling down, but the affair has again raised questions about the privileged treatment the West pays to the communist country. This includes: granting them “most favored nation” trade status, increasing importation of substandard and even dangerous goods that enter the US with little or no quality control and giving them sponsorship of the 2008 Olympic games. In many ways, the economic advantages of dealing with China have created a world in which inhuman work conditions and corruption are veiled by end-of-quarter reports in the black. However when the veil drops, the harsh results of China’s immoral practices are often imported home, where the epithet: “Made in China” is increasingly suitable for the warning section of product labels. Such is the case with the scandal surrounding heparin, a widely used blood-thinner made from pig intestines and other tissues. Chinese-produced doses of the drug recently caused major allergic reactions in over 700 Americans and killed as many as 21 of them. More accurately, it was not heparin itself that caused the trouble, but a substance called hypersulfated chondrotin that contaminated 20 out of 28 FDA-tested heparin samples imported from China. Some of the samples contained as much as 50% of the foreign substance. Furthermore, the scale of the contamination was enormous, since a large percentage of the one million multi-dose vials of heparin purchased each month in the US originate in China. Hypersulfated chondrotin must be artificially manufactured since it does not exist in nature. It has not been approved for human consumption by the FDA, and certainly had no place in imported vials of heparin. However, the molecular structure of the contaminant is so similar to that of heparin, that only very sophisticated testing can detect the difference. This explains why the drug originally passed distributors’ inspections. However, it does not explain how the substance got into the heparin in the first place. As mentioned above, hypersulfated chondrotin is not a natural substance, so it could not have been present in the animal tissues from which heparin is made. However, since its production cost is a fraction of that of pure heparin, strong suspicions have been raised that it was added to the drug, intentionally to boost profits. So far, investigations into the exact source of the contamination have been fruitless, since there is little transparency in China’s economy. There are so many suppliers, producers and middlemen involved in production that it is nearly impossible to pinpoint where the foreign agent was introduced into the blood thinner. In many cases, small-scale farmers working under deplorable sanitation conditions conducted the primary manufacturing of the drug. A recent plague that decimated China’s pig herds made it particularly lucrative for mom-and-pop farmers to try their hand at making heparin. The conditions where some of it was produced are so deplorable that the first FDA investigators believed that merely this could account for the violent reactions the drug was causing. These conditions were not caught earlier due to a scandalous lack of FDA control on all Chinese imports. Senator Charles Grassley (R-Iowa) complained in a recent letter to the FDA that in 2007, the organization had only inspected 11 of the “hundreds if not thousands” of China’s pharmaceutical plants that import to the US. FDA director Joe Famulare admitted that the number of Chinese plants that had been inspected was “within the general range” of what Senator Grassley claimed. The rapidly growing amount of food and drug imported from China exacerbates the problem. In fact, American imports of Chinese food grew 20% last year alone. However, FDA inspector shortages do not explain the disproportion in the number of inspections of Chinese goods as compared to imports from other nations. A March 20 Los Angeles Times article reported that although China currently supplies 22% of drug imports to the US, they received only 6% of the FDA inspections between 2002 and 2007. However, such a solution disregards the differences between Chinese and American standards and puts undue confidence in the corruption-laden communist government. 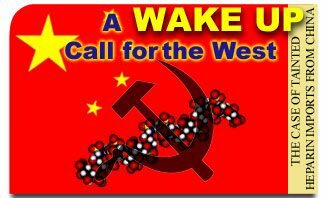 Unsafe worker conditions, dangerous imports and communist corruption will never be dealt with effectively until the West stops treating China as a friendly business partner and recognizes it as the corrupt and conscienceless regime that it is. The West must look beyond economic advantages and consider the plight of Chinese workers and the threat that China poses to the future of Western civilization. It should refuse to trade with the communist country, no longer recognize China as a legitimate government and boycott this year’s Olympic games in Beijing. Although these drastic steps will not be taken in the foreseeable future, the West must start to recognize China as an evil empire and take concrete steps to arrest its increasing growth and influence in the world. The safety of its people depends on it. This entry was posted in Events of 2002, News Commentary and tagged A Wake-up Call for the West, China, Chinese, favored nation, game, import, scandal, trade, west by Michael Whitcraft. Bookmark the permalink.